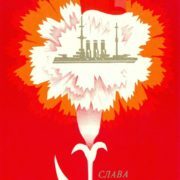 History has turned carnation into a revolutionary flower of proletariat. 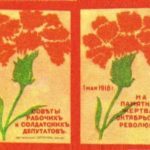 After the events of February 1917, the decision of Moscow printers of Russian Social Democratic Workers’ Party of bolsheviks was to issue cardboard badges in the form of red carnation. 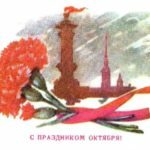 In addition, there was inscription: “Soviet of Workers’ and Soldiers’ Deputies.” They have become a kind of leaflets calling for a fight against the Provisional Government. 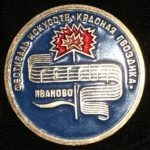 Meanwhile, the badges spread quickly, and the money went on the needs of the revolution. 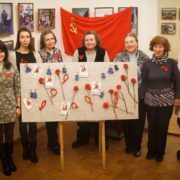 In particular, soldiers storming the Winter Palace in the days of the October fighting, pinned to clothing red ribbon, folded in the shape of carnations. 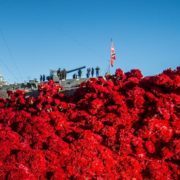 And on the eve of May Day 1918, in memory of the fallen heroes appeared a set of red carnation badges. These badges have long been a rarity. 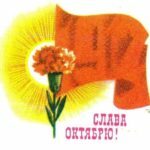 So, why red carnation became the symbol of the revolution? There are other beautiful flowers, a lot of them. In 1793, the workers and artisans of Paris fighting against the tyranny of the royal power, during the first French Revolution, adorned their chests with any red flowers. In particular, roses and tulips, peonies and poppies, and, of course, carnation. They were also worn in the Paris Commune in 1871. Let’s look closely – in the rays of sunlight carnation looks like a bright flame. 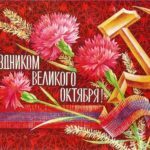 In fact, the bright flower on the clothing of the worker calls to the memory of the fighters who died for the happiness of the people. In addition, it is a sign of readiness of each to follow their example. Indeed, none of the existing flower on earth has such a rich history as a carnation. According to the myth originated in ancient Greece, Goddess Diana with a retinue of nymphs was hunting in the forest. Pulling an arrow hunter noticed a shepherd, who, in spite of formidable prohibitions, did not take his eyes off her unearthly beauty. For this he was waiting for imminent death. However, the Nymphs spared the boy and begged Diana to forgive him. But the capricious goddess came up with another penalty: she transformed the young man’s eyes into beautiful carnations. Since then, this flower is a symbol of courage and ardent impulse of rebellion, and the eternal pursuit of the ideal. Ancient myth continued. 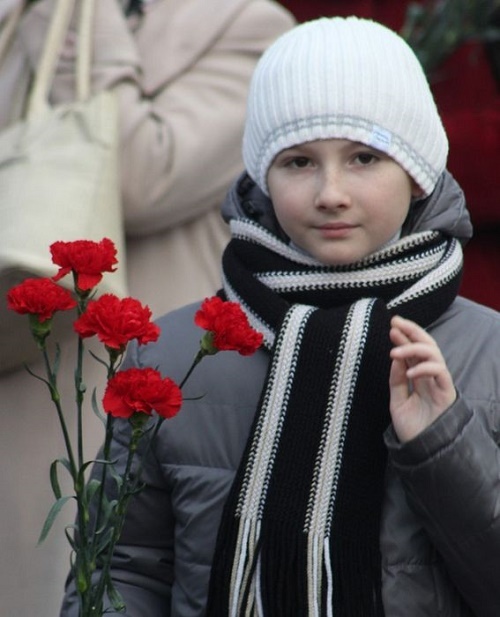 Besides, women defending equality, chose carnation an emblem of their movement. First, in 1907, they came to the first international conference in Stuttgart with purple flowers. And second, in Copenhagen (1910), Clara Zetkin, leader of the German and international labor movement, and Lenin’s friend, went up to the podium with a carnation in her hand. 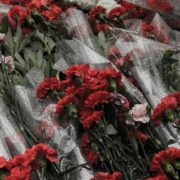 Red flowers expressed the revolutionary enthusiasm of delegates. 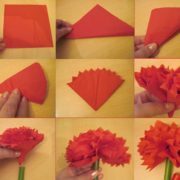 Today carnation flower adorns signs of women’s organizations in the world. Indeed, this flower became a kind of symbol, relay race, that we have received from our fathers and grandfathers. 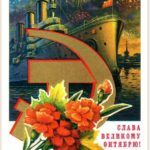 In many cities of the Soviet Union youth clubs get fanned with the revolutionary romanticism of the name – red carnation. 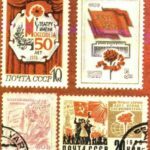 The sign of the revolution, the struggle against fascism and imperialism is present in the many commemorative stamps of the USSR and the socialist countries. “People, beware!” – These words of Julius Fucik placed on the mark of Czechoslovakia near the cloves and olive branch. 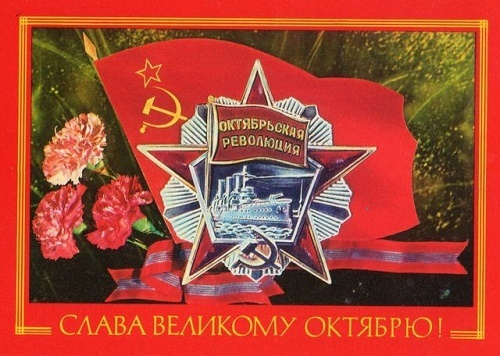 This flower is on the stamp issued to the XXVII Congress of the Communist Party of the Soviet Union. 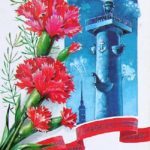 And if to collect all the carnations blossoming on our holiday cards, stamps, badges, and in the hands of the demonstrators, you get a huge red flower. Today, we give them to war veterans, labor heroes, and fighters-internationalists, participants of the international workers’ and women’s movements. Fortunately, the flower of revolution does not fade.